In 1963, the Hoosier Canoe & Kayak Club (HCKC) was founded as a common adventure organization for outdoor enthusiasts who enjoy paddlesports, camping, wildlife, and friendship. During the winter months, we hold our annual trip planning meeting to define our schedule for the upcoming season. This schedule becomes available to the membership in March. Trips are held nearly every weekend from March through October. Our monthly newsletter, our event calendar, and our Facebook page provide detailed information on upcoming scheduled activity. . From calm flatwater to thrilling whitewater to enthralling sea kayak adventures, the club's varied schedule has trips for all abilities and interests. Club trips have sponsors who are responsible for setting a time and place to meet, and deciding which stretch of what river will be paddled. 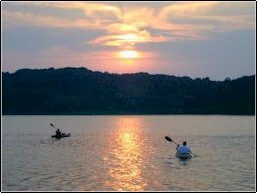 The Club typically does canoe and kayak trips (mostly in Indiana) on White River, Blue River, Sand Creek, Big Walnut, Driftwood, Chain of Lakes, and Flatrock. Favorites trips include a New Year's Day Float, the Ice Falls Trip down Sugar Creek, and the Raccoon Creek paddle in October that coincides with Parke County's Covered Bridge Festival.. You also don't want to miss the HCKC Pirate Paddle and Party that we have every two years. Whitewater trips are open to members with the required skills and equipment. The Club always has a trip (or two) scheduled around Easter to take advantage of spring water flows. During the warmer months, many whitewater members like to work on their skills at the East Race in South Bend. There are sure to be trips scheduled for the long weekends: Memorial Day, Independence Day, and Labor Day. Other opportunities to paddle whitewater are frequent: Tellico, Ocoee, New River, Nantahala, Youghiougheny, Hiwassee, Cumberland Plateau, and French Broad. All the classic southeast trips have been done at one time or another. Once or twice a year a trip opportunity comes along to go somewhere more exotic...our members have paddled in Utah, South America, Canada, Idaho, Colorado, Arizona, Oregon, Alaska, and Maine. If you don't feel you have the skills for whitewater yet, but want to give it a try? Contact someone in the whitewater group, and we'll help you get started! The Sea Kayak fleet scheduled trips include Lake Monroe, Cataract Falls (Cagles Mill), Grayson Lake, South Carolina Coastal Waters, Lake Michigan, the Andirondacks, Ohio River and Lake Superior in 2018. Frequent weekend pickup trips occur when the weather is irresistible and the paddling spirit moves one to action. The club's growing segment of sea kayak paddlers has a large appetite for new, varied, and inviting waters. If you're not experienced, the club offers training classes to help you get going and to refine your skills. These are highlighted on our Training Calendar. Please look over our schedule. I'm sure that you will find something that you will interest you.